Shell PR supremo John Egan will be pleased to note that his energetic efforts to silence The Irish Times over the Corrib pipe line have finally paid off. When he was a BBC reporter, Egan exposed the dirty dealings of Shell in Nigeria, but now he is paid by Shell to put their case against local protesters. The basic reason is pretty simple: they’ve got more and more resources (money, time, people) to push the corporate or government line, and we’ve got fewer and fewer with which to filter out the truth from the propaganda. And when PR people are good and do their job really well, they get the ears of our bosses and make our jobs even harder. That’s what happened to Betty Purcell, a TV producer who recently took early retirement from RTE after many years in charge of programmes including Questions & Answers and The View. In 2009 she tried to make a short human-interest documentary in RTE’s quasi-religious slot Would You Believe? about Willie and Mary Corduff, residents of Rossport, Co Mayo, who stopped Shell from running a gas pipeline through their land. “One day the director Geraldine Creed and the reporter Mick Peelo got a call saying that a Shell PR man was in the RTE canteen and would they go down and talk to him,” Purcell recalled. He tried to persuade Purcell’s team to drop or change the programme. The programme got made only after its dedicated makers jumped through a unique and time-consuming series of management hoops – and RTE broke up the team soon after. 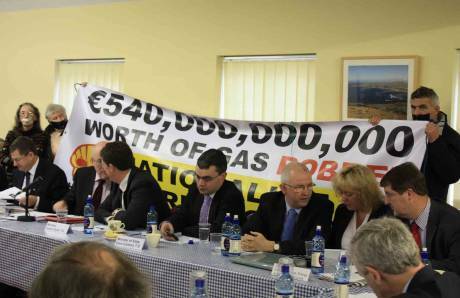 Coinciding with the appearance of the first Garda whistleblower before the Public Accounts Committee, Shell to Sea have published video recordings of two talks given by TD's Clare Daly and Mick Wallace on the issue at last November's People's Forum . Today, a Garda whistleblower is due to give evidence to the Public Accounts Committee. In the video below Clare Daly explains how their involvement with the Garda whistleblowers stemmed from the Corrib protests. Clare Daly also speaks about the need "to have a complete and utter overhaul of the Garda Siochana"
"Our involvment with the Garda whistleblowers in this case actually started as a result of the protests here and in Corrib"
"What is at the heart of the penalty points issue ... It was never about a bit of discretion ...What was at stake here really was systemic abuses, multiple terminations for privileged people, and that's really what it was, one law for connected people and one for everybody else." Clare Daly speaking at the Peoples' Forum entitled "Who Polices the Police?" on the 23rd November 2013 in Inver Community Centre. Here she discusses breaking the penalty points scandal, the Garda whistleblowers and their connection to Corrib. 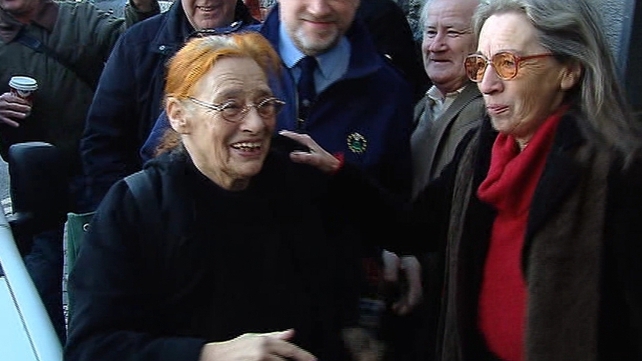 A court case involving anti-war campaigner Margaretta D'Arcy and Niall Farrell has been put back until 13 February. Ennis District Court heard that amendments had been made to the charge against the two. Inspector Tom Kennedy admitted that the defendants had not been served with notice. VETERAN Shell to Sea campaigner Maura Harrington was last week disqualified from driving for two years by Judge Denis McLoughlin. Her case was before Belmullet District Court for offences allegedly committed on August 1 and 3, 2012, which involved obstruction, dangerous driving and criminal damage. Ms Harrington, of Doohoma, did not appear in court for medical reasons. Airing Erris: The Media and Shell Corrib will take place on Saturday 18th January in the Seanscoil, Ceathrú Thaidhg, in Erris, County Mayo, 12 noon til 6pm. 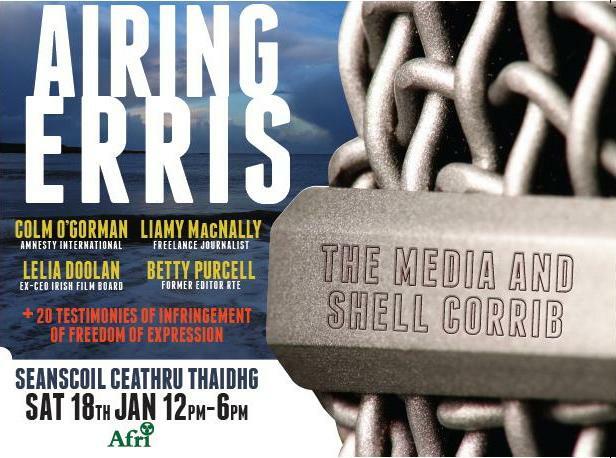 This will be the first of a series of two seminars on the media treatment of the Shell Corrib issue. Shell-to-Sea activist and retired schoolteacher Maura Harrington has been convicted of dangerous driving, criminal damage, and four public order offences in the district court. Harrington, with an address in Doohoma, Ballina, received a two-year driving ban and was fined €600. She was also ordered to pay compensation amounting to €776 for damage caused to a Garda vehicle. Harrington was not present for the hearing in Belmullet District Court in front of Judge Denis McLoughlin on Wednesday.